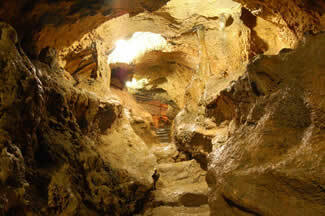 Fujido is a stalactite cave located in Ueno-mura (Ueno Village) at the south-western tip of Gunma. Situated 700 meters above sea level and 2.2 km long, it's the largest cave in the Kanto Region. It takes about 40 minutes to go round the cave, and you can see stalactites forming gigantic pillars and many narrow branch caves along the way. Inside it is about 11 degrees centigrade throughout the year, so it's heaven in summer.